Individuals and even companies need to issue checks most of the time whenever there is a significant monetary transaction. It is always a good practice to keep a record of the checks issued and received in a Check Register Samples, the purpose of the check, the payee, and other necessary details because of auditing purpose and most importantly because sometimes checks also bounces. It such cases, you can track back to the payee and let them know the situation. 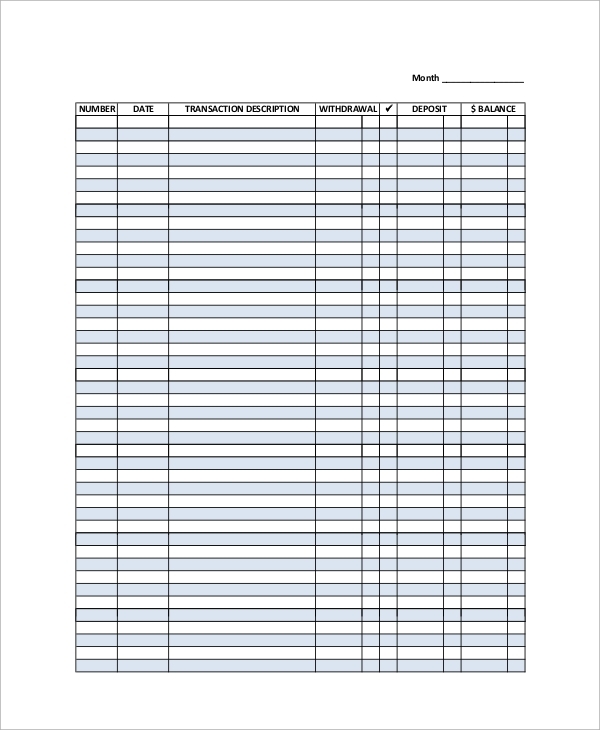 This is a complete monthly check register. It contains a check number, check date, vendor number from whom the check is received or sent to, payee name and address, the purpose of the check, the amount, and other remarks. At the end of the month or quarter, company or individual can conduct an audit to find the total, net income, and other parameters. 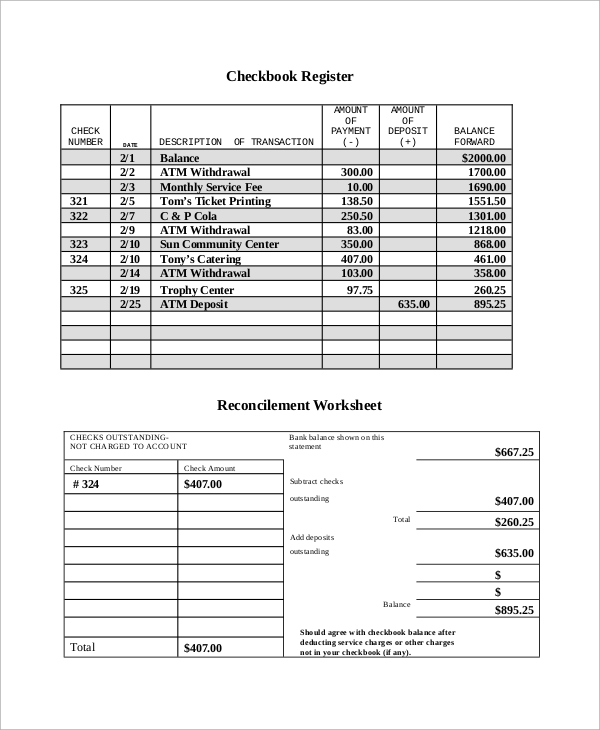 Checkbook Register is a manual for kids and students to learn the importance of checkbook account and how to prepare that. It explains the different types of checking accounts, the different terms associated with them and what they mean in layman’s term, how to keep track of checks issued and received with valid parameters for future reference and auditing. 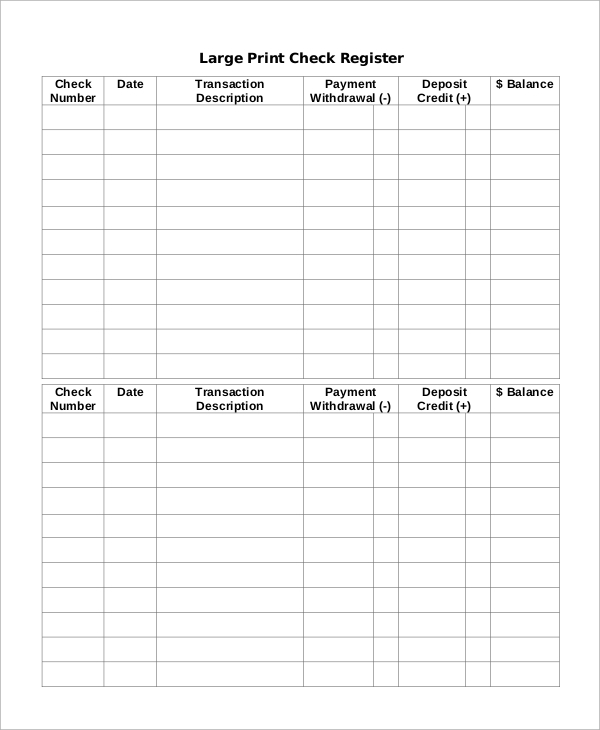 This is a complete blank check register to keep a record of monetary transactions. It can also be used for cash transactions as well. It contains a tabular form whereby you can write down the date, transaction details, withdrawal, deposit, balance and some necessary information for future calculation. 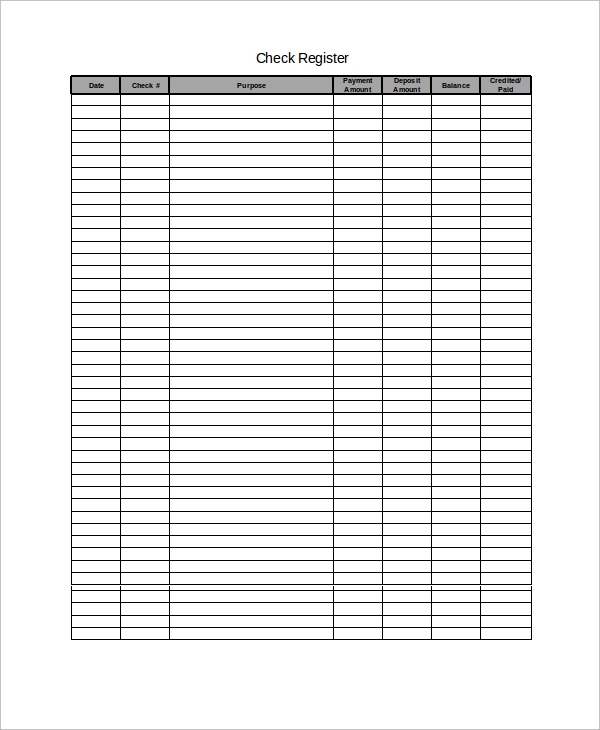 Check registers are useful to keep records of a check issued and received from time to time in any business and for self-employed persons as well. They help to understand the current balance, find the fraud who issued a check which has bounced among hundreds of checks and do a proper auditing. There are check registers for kids to play with. They are also useful to keep track of your income on a monthly and quarterly basis. 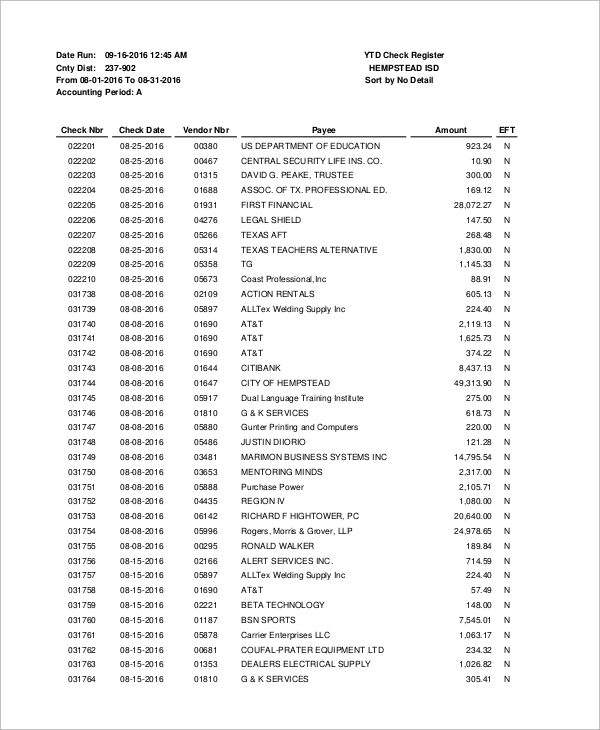 You can also see the Payroll Register Samples. This is a check register in Microsoft Excel. It has provisions to record date, check number, payee name, the purpose of it, payment and debit, deposit and running balance. It helps in audits and filing income taxes and also getting a quick check of the current balance. This is a check register for kids. 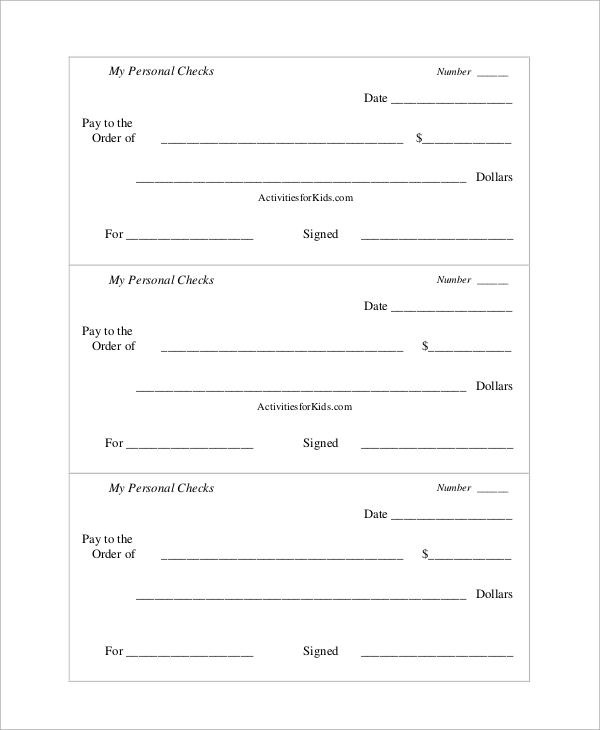 It is a blank check format whereby the kids can write down data just like the original check to keep a proper track of money spent and received. It can also be used as sports and games where there is a role of monetary transactions. 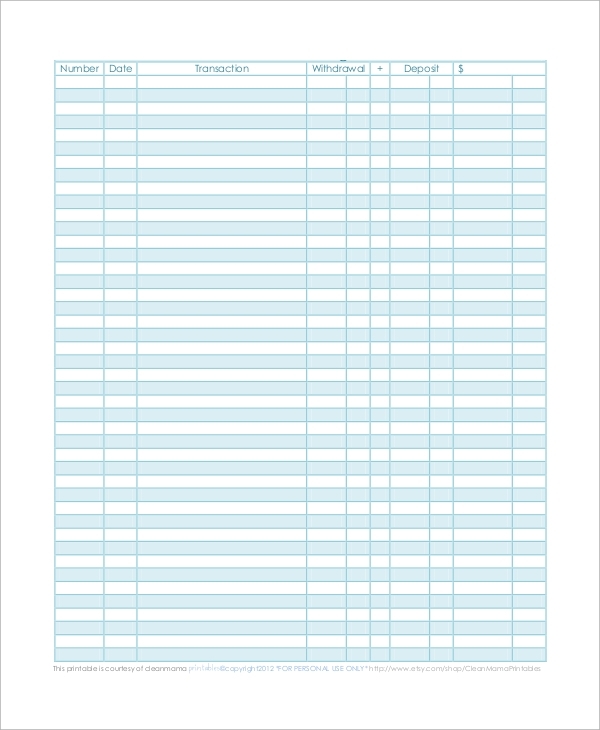 The targeted audiences for Printable Check Register are widely spread. There are check registers for kids to play with, for teenagers to keep track of their small incomes and for self-employed individuals to keep a record of the monetary transactions for auditing purpose and calculate the running balance anytime. For companies, they are most useful to keep a record of all the transaction because among hundreds of checks issued and received; there can be one or two which might bounce and the payee can be tracked and contacted. 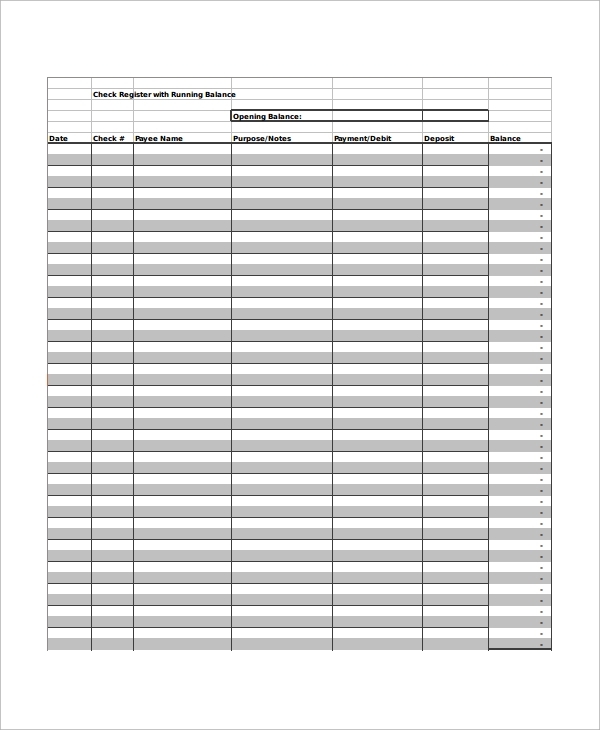 There are different kinds of Sample Check Registers presented above which are very useful for any individual as well as companies. In companies, they can be used to for auditing purpose and to take proper action in case of fraudulent activities. For individuals, it can help to calculate the net income and expenditures and understand the current balance in case of emergency.